I was asked to make a card for a friends dad. I used an A4 card folded in half and used a decoupage design which I bought from my local card shop. 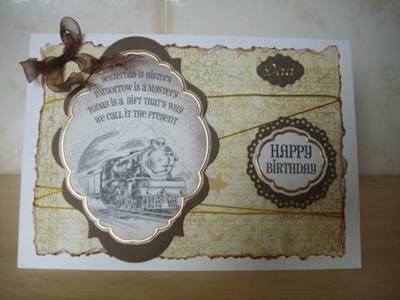 Using the colour from the train topper I kept it to brown and gold with a bit of gold cord wrapped around several times. The toppers were mounted onto Spellbinders and also thought I would try the way Christina did her bows with the heat gun. Although you don't usually put ribbons on male cards I thought it looked good and my friend was very happy with the outcome. The card is really lovely and the addition of the bow makes it really special. Adding ribbons and a bow to a male card can be just what the man likes and you know what your recipient likes ... so why not. Because the colour scheme is muted it fits the bill perfectly and I am not surprised that he liked it too. ..I love that you put a bow on it.. I do this with a lot of my cards..even if they are for a man. It all depends, but I dont think it makes the card any less ' masculine". Great idea for a man's card. They are so hard to make for. Gives us lots of food for thought. Thanks for your advice. Did you mark a straight edge to follow or used a ruler to tear along? I can't imagine that I would be able to tear in such a straight line! Well done. Super male card. I love your card. Its always good to see male themed cards for inspiration. How did you get such a nice even "tear effect" around the matt/background paper?? ?